"The English Masque" by Felix Schelling. mehr als ein improvisirter Maskenball." 2 Evans, The English Masque, 1897, p. xxxiv. scenic contrivance can lend to the united effect. On the other hand, the speech of the masque, whether of presentation or in dialogue, and the music, both vocal and instrumental, were from the first in the hands of the professional entertainer, and developed as other entertainments at court developed. The masque combined premeditated with unpremeditated parts. The first appearance of the masquers with their march from their "sieges" or seats of state in the scene, and their first dance — all designated the "entry" — was carefully arranged and rehearsed; so also was the return to the "sieges" or "going cut," and this preparation included sometimes the preceding dance. The "main," too, or principal dance, was commonly premeditated, as in Jonson Masque of Queens, where the masquers and their torchbearers formed in their gyrations the letters of the name of Prince Charles. Between the "main" and the "going out," two extemporal parts were interpolated, the "dance with the ladies" and the "revels," which last consisted of galliards, corantos, and la voltas. 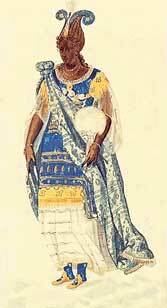 It was in the development of the "entry" and the "main" that the growth of the masque chiefly consisted. The nucleus of a masque a dance. and his Speeches at Prince Henry's Barriers. Gifford, Jonson, vi, 469; and vii, 103 and 147. See, also, Bacon's accurate use of these terms, Essays, ed. Wright, 1887, 156-158.
or after Jonson's time was the term 'masque' used with precision. To most of his predecessors and contemporaries a masque meant any revel, masking, or disguising, from a visit such as that of Henry VIII and his courtiers in mask to the palace of Wolsey, immortalized by Shakespeare,1 to imaginative, mythological interludes like Heywood's Love's Mistress or Dekker and Ford's Sun's Darling. Indeed, even belated moralities such as the Microcosmus of Nabbes were included among masques. 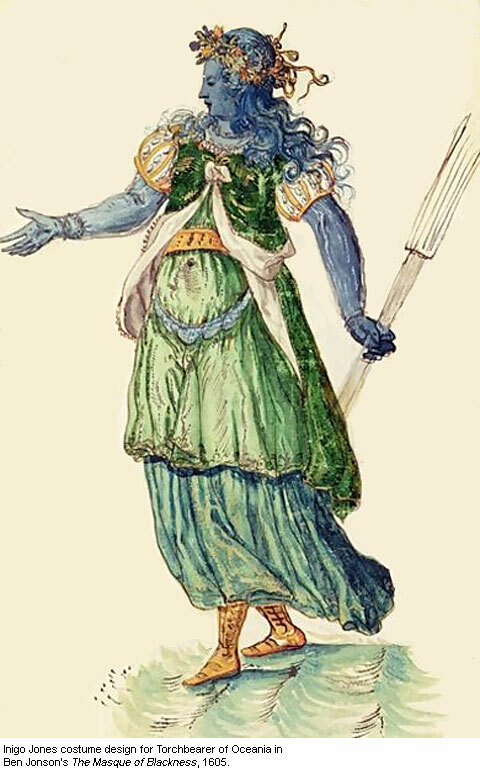 In a full recognition of the precise significance of the term masque, we may deny that title, with Soergel and Brotanek, to Milton's beautiful Comus; because the dancers and actors are here probably the same persons and not divers as in the true masque.2 But in view of the looseness of the employment of the word as a term in its day, and the intimate relations of the masque in origin and growth with the numerous ludi, disguisings, mummings, and other like entertainments, its predecessors, the subject may be considered here with some latitude, and in no absolute neglect of the various congeners that accompanied it. Loose contemporary employment of the term. 1. Henry VIII, 1, iv. 2. Soergel, 78; Brotanek, "Die englischen Maskenspiele," Wiener Beiträge, xv, 1902, p. x. 1 Hall, Chronicle (1548), ed. 1809, p. 526. This was in the third year of Henry's reign, 1512. 2 Brotanek, 64-68; Cunliffe, "Italian Prototypes of the Masque and Dumb Show," Publications of the Modern Language Association, xxii, 1907, pp. 140-156. Chambers, i, 401; and ibid. 391, on the early connection of the masque with the Feast of Fools, and the exuviae worn by the rout of "worshipers at the Kalendae." Queen Elizabeth on her numerous progresses into the provinces of her realm. For the second he takes us back to the masked visitations and dances which had formed a popular variety of courtly amusement from the days of King Edward III downward.1 Nor does he deny the complex influences of riding, procession, pageantry, and holiday revels in offering models, precedents, and suggestions to this most graceful and effective of dramatic by-forms. Interesting as is the subject, none of these origins of the true masque concerns us here, or we might assign to John Lydgate, about 1430, the credit of giving a literary bias to the mumming of his time; trace disguisings into early Tudor days, tell of the rich and elaborate pageantry which sometimes accompanied them there; and dilate on the rejoicings of Christmas, New Year, Twelfth Night, Candlemas, Shrovetide, and May Day, all regarded as naught without masking and disguising.2 Nor did the maskings of Elizabeth's earlier days differ so much in kind as in degree, although the queen added to the occasions for these shows by her frequent progresses into the provinces, where her nobility vied with her civic entertainers, each to outdo the other in novelty and cost. John Lydgate and early mumming. The queen's entertainment at Kenilworth, 1575. 2 On the mummings of Lydgate, see Brotanek, 305; and Anglia, xxii, 364; and above, p. 74; and see, especially, the pageants on the betrothal of Prince Arthur and Katharine of Aragon, 1501, Shakespeare Society's Papers, i, 47-51. 3 Nichols, Elizabeth, i, 418-526; and Schelling, Gascoigne, 63-71.
purpose some half dozen poets were assembled, among them Gascoigne, Hunnis, and Mulcaster, and the literary and even the dramatic elements were no less a matter of forethought than the feasts and the fireworks. Three years later, when her majesty was entertained at Norwich, we find Thomas Churchyard using comedy as a foil, interspersing amongst his songs and speeches a "dance with timbrels," and "a heavenly noyse of all kinde of musicke," besides employing the device of a canvas cave to effect the sudden appearance and disappearance of nymphs in unexpected places, all of which suggests the grand ensemble of poetry, music, dancing, and stage carpentry in which the later triumphs of Jonson and Inigo Jones were soon to consist.1 Sir Philip Sidney, too, had his part in the development of dramatic elements in the entertainment and the "barriers" or tournament. In 1578, as the queen was walking in Wansted Garden, Leicester's seat in Waltham Forest, she was regaled with a lively little pastoral idyl, The Lady of May, in place of the customary formal speech of welcome. Here was dialogue in prose and contest in song, comic relief in Master Rombus, the pedant, but no dancing.2 The Lady of May is a pastoral, for such was the mode of the moment, and Sidney rode always on the crest of the wave of his time. No less a step in advance were the sumptuous devices accompanying the mock tournament of 1581, likewise referable to the taste and inventive talents of Sidney. The barriers and entertainment thus advanced; the development of the true masque was to come later. Sidney's Lady of May, 1578. 1 Nichols, Elizabeth, ii, 180-214. 1 Ibid. iii, 262-352. The proceedings really continued until Shrove Tuesday, March 3, 1595. 2 Ibid. 279; and Ward, ii, 27 n.
3 Nichols, Elizabeth, iii, 279-281. 4 See ibid, iii, 281, 297, 309. On the externals of these Masques, see Brotanek, 340.
court of Prince Purpoole with her royal presence on Shrovetide evening, 1595. It opens with a "hymn in praise of Neptune sung by Nymphs and Tritons" attendant on Proteus, who comes to fulfill a pact with the Prince made long since. An Esquire narrates in verse how the Prince, returning along the sea from his victory over the Tartarians, surprised Proteus asleep, and though the sea god assumed various fair and loathsome shapes, succeeded in holding him fast until he promised as ransom to remove the adamantine rock that lies beneath the arctic pole and to transport it whither the Prince might will, assured that "the wild empire of the ocean would follow the rock wherever set." But this is to be fulfilled only on condition that the Prince on his part bring Proteus into the presence of a power "which in attractive virtue" shall "surpass the wonderful force of his iron-drawing rock," the Prince offering that he himself and seven of his knights shall be inclosed within the rock as hostages. The upshot is obvious. Elizabeth's is the "attractive virtue" which draws all hearts. Proteus strikes the rock, and the knights, issuing forth, dance with the ladies their "galliards and courants;" and the performance ends with a second song, "the while the masquers return into the rock." Space has been given to the description of this masque because it constitutes the type out of which the later masque was to grow. In both productions the structural order is song, dialogue, and the entry of the masquers, followed by the dances and the closing song. The Masque of Proteus well presents, too, the moment of surprise, so effectively to be employed in later times, when the rock opens at the stroke of the "bident" of Proteus and the masquers issue forth. The Masque of Proteus the type of later masques. The entertainments of the latter years of Queen Elizabeth exhibit little that is novel or to any extent contributory to the history of the masque. With the accession of James came a new order of things. The worn and exacting old queen was succeeded by "the British Solomon," with his known penchant for learning and poetry; and the poets and scholars accordingly burst into a chorus of adulation. Nichols lists no less than three and thirty tracts in verse and prose, inspired by the accession and coronation of the new monarch and more than a score of "miscellaneous eulogistic tributes to King James and his family," most of them of the earliest years of his reign.1 Daniel was early in the field with a lengthy Panegyric Congratulatory delivered at Burly-Harington, before James had reached London; and Jonson soon after devised the pageants of the royal welcome in the city and the "Panegyre" on the session of the king's first parliament.2 But neither with these nor with the devices and pageants of his coronation and his progresses, which he continued after the manner of his predecessor, are we here concerned. For with the reign of James begins the speedy development of the masque, which soon outstripped in elegance, elaboration, and artistic value all other entertainments at court. The masques of the reign of King James are no less remarkable for their learned ingenuity than for their originality and splendor; for if the frivolous nature of Queen Anne of Denmark lent them vogue, the pedantry of her royal spouse often determined their character. an impetus to the masque. 1 Nichols, James, i, p. i.
to have been concerned in these pageants. 2 Cf. the old comedy of Nobody and Somebody, printed in 1606.
before the throne, sing a song, and the dances, alternating with other songs, follow. The masque ends with a return of the masquers to their first position on the mountain.1 In this masque of Daniel's we have not, as has been maintained, the earliest regular masque, for none of the elements that constitute it are wanting to the two masques of the Gesta Grayorum already described.2 And, besides, with all its allegory, classical lore, costume, tableaux, music, and dancing, the production is void of the least vestige of drama. It was the author of the Alchemist, not the author of Philotas, who raised the masque to a place in dramatic literature, as it had been those tuneful lyrists, Campion and Davison, who first wrote an English masque in regular form. Jonson's career as an entertainer at court began, as we have seen, in the year of the accession of King James. It lasted until 1631, within a few years of the time of his death. During a period of some thirty years Jonson composed no less than nine entertainments, three "barriers," two antimasques, and three and twenty masques proper, these latter constituting more than twice as many as were written by all his competitors and imitators combined. Jonson contributed more than twenty masques to the thirty-seven of James' reign; Campion, Daniel, and perhaps Marston alone, writing more than one each among his rivals.3 Nor was Jonson's primacy in the masque grounded alone in the quantity of his work. Jonson's activity as a deviser of masques at court. 1 Grosart, Daniel, iii, 204. 3 The manuscript of the Masque of Coleorton, reprinted by Brotanek (328-337), suggests the possibility that some of the private masques of Jonson have perished. He paid no attention to his later works. His masques are what Daniel's never were—dramatic,—what Chapman's failed to be—genuinely inventive,—what Townsend and Davenant strove for in vain, that is, supereminently poetic. In short, they were rivaled but once by Campion, and by Francis Beaumont, and once again by William Browne. Several classifications of the masque are possible. We might consider its form, with the growth and degeneracy of the antimasque. We might treat of the masque mainly with reference to its costly and gorgeous performance and the august occasions to which it lent its novel splendors; or we might turn our attention to its material and divide it, with Brotanek, into groups, mythological, astronomical, mythological-allegorical, allegorical-romantic, and allegorical-historical, did not the saving grace of humor forbid.1 It is safest to tell the story of the Jacobean masque in simple chronological order. On January 6, 1605, the first of Jonson's masques, The Masque of Blackness, was acted at Whitehall. It formed part of Queen Anne's entertainment of the Duke of Holstein, her brother, and on the same day Prince Charles was created Duke of York. 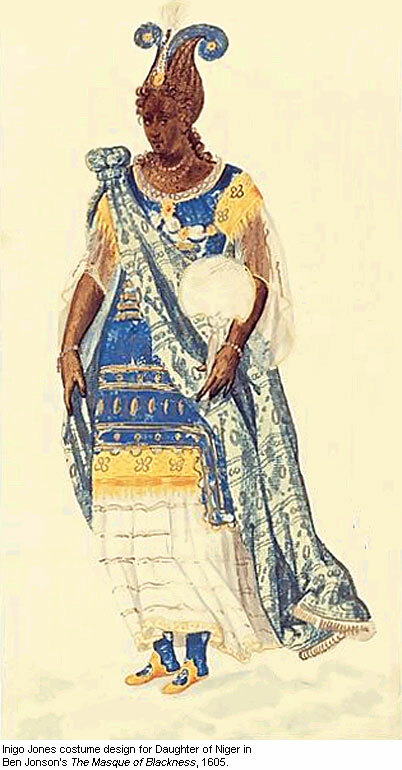 Moreover, the queen was herself one of the masquers, and had suggested to Jonson his subject, a masque of blackmoors.2 On this hint the poet conceived the idea of twelve "negrotes" (the masquers), who appear in mid-ocean, ranged "in an extravagant order" on a floating concave shell, and attended by Oceaniæ (the light bearers), by Niger, Oceanus, tritons, and other sea monsters. They are seeking a land, foretold by prophecy, wherein their darkened skins shall be changed to fairness. Britannia is that land, and the Jonson's Masque of Blackness, 1605. 2 Gifford, Jonson, vii, 6. 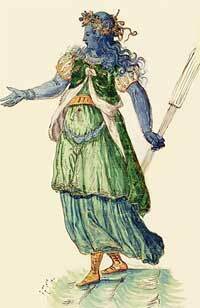 Novelty of the setting of this masque by Inigo Jones. 2 Cynthia's Revels, Induction; and see above, p. 173. 3 Gifford, Jonson, vii, 45. 1 See Daniel's strictures quoted below. Tethys' Festival, Grosart, Daniel, iii, 305, 306. 2 Gifford, Jonson, vii, 70-72. Campion, Phœbus' Knights, 1607; the elaborate music of this masque. 1 (see Pliny, xxxi, 17), as it is of modern Wagnerian opera. Cf. also, Bacon, Of Masques and Triumphs: "Some sweet odours suddenly coming forth, without any drops falling, are . . . things of great pleasure and refreshment." Wright, Bacon's Essays, 157. Jonson's masques of 1608 and 1609. The Masque of Queens, 1609; the antimasque. 1 See Bullen, Marston, iii, 385. 2 Cf. Shirley's Love's Hue and Cry, and Drayton's Crier. Schelling, Seventeenth Century Lyrics, 231, and Elizabethan Lyrics, 195. 3 Gifford, Jonson, vii, 107. 1 Ibid.108; and cf. above, i, p. 361. 2 Ibid.138. A minor ingenuity of this masque was the arrangement of the masquers at one time, "graphically disposed into letters and honoring the name of . . . Charles, Duke of York." Ibid.144. In a later masque, White Cupid's Banishment, 1617, the words "Anna Regina, Jacobus Rex," and "Charles P." were thus "graphically disposed." Bacon dismisses this subject with the words: "Turning dances into figures is a childish curiosity." "Of Masques and Triumphs," Essays, 156. Rivalry of Jonson and Daniel in the masque. 1 Cf. above, i, p. 478; ii, p. 101. 2 On this, see below, p. 156. 1 Jonson's dedication to Prince Henry, Gifford, Jonson, vii, 104; Grosart, Daniel, iii, 305. 2 Prince Henry's Barriers, Gifford, Jonson, vii, 149. 3 Grosart, Daniel, iii, 315. As may be supposed, the cost of these entertainments was often very great. Two contemporaries declare that Jonson's Masque of Blackness drew £3000 out of the Exchequer.2 His Masque at the marriage of Viscount Haddington cost twelve gentlemen contributors each the sum of £300. But it seems that in both these estimates the cost of the entire entertainment, supper, and wines must have been included.3 The total cost of Jonson Love Freed from Ignorance amounted to £719 1s. 3d. Jonson received £40 of this sum "for his invention," Inigo Jones as much "for his paynes and invention," Great expense in the performance of masques. 2 Nichols, James, i, 468, 469. 3 Ibid. ii, 175. Cf. the expense of Lord Hay's masque in honor of the French ambassador in 1616, which cost, the supper included, £2200; and Bacon's expenditure of £2000 on the Masque of Flowers, 1613. 1 Collier, Life of Jones, II. 2 John More of Sir Ralph Winwood, 1610, Nichols, James, ii, 371. One of these masques was certainly Jonson's Love Freed from Ignorance; the identity of the other is not certain. See Brotanek, 345. 3 For the date of this masque, see the discussion of Brotanek, 346.
which Robin Goodfellow satirically recounts the difficulties of a plain man's access to a masque. We have here a picture, doubtless only too true to the life, of the confusion and petty intrigues that attended a royal masque at Whitehall. Masquerado, who would "make them a show himself," is not impossibly Daniel once more; but the sketch is much too slight to make the identification at all certain. But one other masque belongs to this immediate period, the anonymous Masque of the Twelve Months, acted doubtless in January, 1612.1 Here, after a humorous dialogue between Pigwiggen, a fairy, and Madge Howlet, the twelve spheres descend and call Beauty from her fortress, represented as a huge heart. From this, opening, there issues forth not only Beauty, but Aglaia attended by "the two Pulses." An antimasque of pages follows, a second "of moones like huntresses with torches in their hands," and a species of grotesque pas de seul by a personage called Prognostication. At length the masquers descend, arrayed to signify the twelve months, and "Somnus, hovering in the air," sings the final song. The variety of this masque, though it is not badly written, is its chief claim to consideration. Masque of the Twelve Months. Death of Prince Henry, a temporary abatement of the masque, 1612. 1 Brotanek very properly rearranges the order of this masque as printed by Collier (Life of Jones, 131-142), so that the dialogue between Pigwiggen and Howlet comes first, the masque with which the manuscript opens following. court, accepted the post of tutor to the son of Sir Walter Raleigh and traveled with his charge into France.1 But the sorrow of James' court was shortlived.Before two months had expired the court was agog with flutter and expectation of the marriage of the Princess Elizabeth to the Palsgrave, and masques were once more preparing and practicing. 1 Collier, Life of Jones, 14, 16; Conversations with Drummond, 21. 1 See the poet's words, Nichols, James, ii, 571, 572. Bacon as a patron of the masque. 1 See above, p. 102; in 1592 Bacon wrote speeches for a Device presented to the queen when entertained by Essex at Twickenham Park; he contributed six prose speeches to the Gesta Grayorum in 1595 and in the same year wrote further speeches for the same earl's entertainment of the queen on the anniversary of her accession. Bacon was "the chief contriver" of Beaumont's masque, 1613; and the chief "encourager" of The Masque of Flowers in the next year. 2 Nichols, James, ii, 592.
the dramatist wholly lost in the occasional poet. This was Beaumont's only masque. The Masque of Flowers, 1614. 3 Nichols, James, ii, 725. 1 Chapman's Masque had cost Lincoln's Inn alone £1086 8s. 11d. See Dugdale, Origines Juridiciales, 1671, 286, for particulars of the assessments. 2 Nichols, James, ii, 745.
alchemists" and "imperfect creatures with helms of limbecks on their heads. "1 The Golden Age Restored (1616) is a beautiful fancy in which Pallas turns the Iron Age and his attendant evils to statues which sink out of sight. It is one of the most poetical of Jonson's masques. The [Anti] Masque of Christmas (1616) is a piece of drollery in which that jolly personage introduces his sons and daughters, among them Carol, Wassel, and Minced-pie. In it Cupid (who forgets his part) and his mother Venus, a deaf tire-woman, also figure. In The Vision of Delight and in Lovers Made Men (both 1617), Jonson returned to more normal forms. Pleasure Reconciled to Virtue (1618) is of interest alike for the extraordinary scene in which Altas is represented "in the figure of an old man, his head and beard all hoary and frost as if his shoulders were covered with snow;"2 and from the opening entry of Comus, "the god of cheer or the belly," a personage who may well have conveyed a hint to an impressionable child of ten named John Milton. King James was so pleased with this masque that he ordered it repeated, like each of its three predecessors;3 and for the second performance Jonson wrote an additional antimasque which he called For the Honor of Wales. William Browne's Ulysses and Circe, 1615. 1 Gifford, Jonson, i, 237, 240. 4 Entitled The Inner Temple Masque, and first printed in 1772. Other masques by various hands. 1 Brotanek, 218, and 353; also 328-337, where the masque is reprinted. 2 Letter from John Chamberlain to Sir Dudley Carlton, January, 1618, quoted by Collier, i, 409. No trace of this masque remains. See Fleay, ii, 343. Late in 1615 Inigo Jones had returned from abroad to enjoy the reversion of the office of surveyor of the king's works, which he had long been promised and which had lately fallen in; and for some years we hear little of his employment in connection with the masque.3 He was busy with more important projects, building and designing for the king. Moreover, after the gorgeous heights which masking reached at the marriage of the Princess Elizabeth, there was a perceptible falling off in the expense and elaboration of these entertainments. To this period, too, belongs the breach between Jonson and Jones, which was certainly complete as early as 1619, in which year Jonson reported to Drummond that "when he wanted to express the greatest villaine in the world, he would Inigo Jones and his quarrel with Jonson. 1 Collier, Jones, i; Fleay, ii, 82, 344. 2 Historia Histrionica (1699), ed. Dodsley - Hazlitt, v, 405. 3 Jones seems to have assisted Jonson in Love Freed from Ignorance, the Christmas antimasque in Oberon, Neptune's Triumph, and Pan's Anniversary, though Jonson acknowledged his share only in the last. 3 Gifford, Jonson, i, 453 n.; and see as to Ignoramus, above, pp. 78, 79. "neighbors from St. Katherens," and Urson and his bears. Time Vindicated, of the next January, was given with unusual splendor, but one of the antimasques had degenerated into a dance of tumblers and jugglers. Neptune's Triumph for the Return of Albion, projected for January 6, 1624, to celebrate the return of Prince Charles and Buckingham from their futile and vainglorious trip into Spain for a royal spouse, was postponed again and again, and finally abandoned;1 although much of its material was worked over into The Fortunate Isles, presented on Twelfth Night, 1624, to celebrate the betrothal of Prince Charles to Henrietta Maria. 1 Ibid. i, 451, Cunningham's note; and Brotanek, 359. 2 In pageantry such as that of the Lord Mayors' shows alone did this obvious allegory of old time persist any later. See Fairholt, Lord Mayors' Pageants. 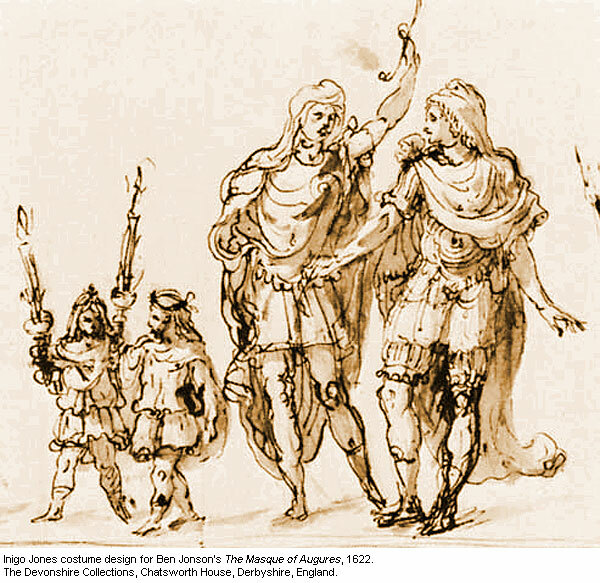 Classical personages, imagery, and allusions in the Jacobean masque. 1 Gifford, Jonson, vii, 113 n.
an all but universal mannerism of the age. Nor did the masque, despite the classical learning of its authors, hesitate to follow the popular drama in mingling satire, abstraction, and the personages of every-day life with the stately gods of ancient Greece and Rome. Jonson and Chapman are deep in their show of classical learning. Yet it was Browne who achieved the one thoroughly successful masque on classical story, his masque of Ulysses and Circe. And this is explained by a third characteristic of the Jacobean masque, its general lack of definite plot or design; and outside of Browne and Jonson, once more, its common want even of any certain central idea. Importance of Inigo Jones and of Jonson to the growth of the masque. Degeneracy of the antimasque. 1 Cf. the use of the word in The Masque of Queens, ibid.107, with Tethys' Festival, Grosart, Daniel, i, 311, and The Masque of Flowers, Nichols, James, ii, 739. See, also, Brotanek, 139-169. When the idea of contrast was lost in the antimasque and that of mere diversion substituted, three changes soon took place: the introduction of a second — in the next reign, even of a third and fourth — antimasque; 1 secondly, a change from the group of characters of one kind, such as Jonson's witches or his satyrs or cyclops, to the medley of personages which we meet in Beaumont; and lastly the development of scenes of drollery in dialogue and the infusion into the antimasque of the element of satire. For this last Jonson and the taste of his master must be held largely responsible. But in The Masque of Mountebanks and in Middleton's Masque of Heroes as well as in Jonson's Love Restored, Augures, and News from the New World, the interest is chiefly of this kind; though Jonson alone wrote productions such as Christmas and The Gypsies' Metamorphosis, in which the antimasque has usurped all. 1 In The Masque of the Twelve Months the antimasquers dance several times. Both Chapman's and Beaumont's masques of 1613 have two antimasques. Jonson apparently borrowed the device for the first time in Mercury Vindicated, 1615.
its influence on the drama. 1 Cf. Civitatis Amor, an entertainment by water, by Middleton, 1616; Bullen, Middleton, i, 267. 2 See Fairholt, Lord Mayors' Pageants, Percy Society, 1843. Greg, List of Masques, Pageants, etc., 1902, adds several titles to Fairholt's list. 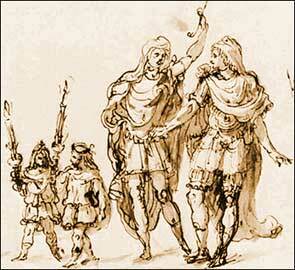 3 This was acted before Prince Charles in 1624; Gifford, Jonson, viii, 454. 4 Thorndike, "Influence of Court Masques on the Drama," Modern Language Publications, n. s. i, 116. And footing runs away with all." 1 Love's Labour's Lost, v, i; Merry Wives, v, v; "As You Like It", v, v. On this topic, see, also, H. Schwab, Das Schauspiel im Schauspiel, 1896. 2 Winter's Tale, IV, v; Tempest, III, i; IV, i; Cymbeline, V, v.
3 Littledale, ed. of The Two Noble Kinsmen, 145, Shakspere Society's Publications, 1876. Last of Ben Jonson's masques. 2 Gifford, Jonson, Memoir i, p. x. 1 See An Expostulation with Inigo Jones and the two epigrams that follow it. Gifford, Jonson, viii, 109-115. 2 See the two letters of James Howell to Jonson on this subject, Jacobs, Howell, 325, 376.
ballad on the procession preceding it is reprinted in Maidment Logan, Davenant, i, 324. And see above, pp. 88, 89. 1 B. Whitelocke, Memorials of English Affairs, 1682, p. 22; quoted by Dyce, Shirley, i, p. xxviii. Britannicum, with eight changes of scene and as many antimasques. A feature of Carew's masque is the carping, cynical Momus, who speaks always in prose with a wit both searching and risqué. One of the antimasques represented a battle, marking a complete degeneracy from Jonson's conception of contrast, while "a prospect of Windsor Castle" was amongst the novelties of scene.1 Carew's masque is often poetic in the lyrical parts; as compared with Shirley's it is lacking in dramatic instinct. As to form, Shirley's masque is chaos in activity; Carew's, chaos inert. 1 Ebsworth, Carew, 134 and 164. 2 The countess dowager, a patron of poets from Spenser to Milton, was the wife, by her second marriage, of Lord Chancellor Ellesmere. Sir John Egerton, his son by a former marriage, married Lady Frances Stanley, the countess dowager's daughter by her first marriage, and became Earl of Bridgewater. Thus Arcades and Comus were celebrations within the same family. 1 Letter of Sir Henry Wotton to Milton, April 13, 1638. 1 Two minor masques are The King and Queen's Entertainment at Richmond, and Corona Minervœ, both in 1635, the last not mentioned in Brotanek's list. See the reprint of the former by Bang and Brotanek, Materialien zur Kunde, ii, 1903. 2 Cf. Davenant play The Platonic Lovers, and the treatment of the whole subject below, pp. 347, 348.
knight, and damsel, occupying the place of one of the antimasques, while the others were furnished by the ever popular humors of the street-folk of London. Lastly, Salmacida Spolia (January 21, 1640) a double masque, in which both Charles and Henrietta Maria took part, discloses the malicious fury of Discord, none too prophetically calmed by the wisdom of Philogenes, impersonated by the king. The antimasque contained twenty "entries," as they were now styled, some of them danced by three or two, or even by a single character. Brotanek has assigned to Davenant's another masque entitled Luminalia, presented by the queen and her ladies, February 6, 1638.1 This is a production of no little fancy; nor does it fall below the graceful mediocrity of Davenant.2 Be Luminalia whose it may, Davenant's work in the masque is direct, not particularly original, and decidedly unlyrical; though, with the ever-fertile and ingenious devices of Jones, evidently sufficient to please the none too exacting demands of a time in which serious-minded men, whether Cavalier or Puritan, were busied with affairs other than "toys." This enumeration of English masques might be materially lengthened by stretching our period to include a few true masques that fall without it;3 by the identification of some few manuscripts recorded as masques in the lists and dictionaries of the drama;4 Masque-like plays. 1 "Ein unerkanntes Werk Sir William Davenant's," Anglia, Beiblatt, xi, 177. 2 See Fuller's Worthies' Library, iv, 117, 615, and 630, for some novel devices. 3 Shirley Cupid and Death, 1653; Jordan Fancy's Festival, and Howell Nuptials of Peleus and Thetis, both 1654, the last acted in Paris. which Halliwell-Phillipps, Dictionary, appears to name masques by their personages. 1 On the relation of this play to the masque, see Seorgel, 80-82. 2 On the relations of plays of this type to the masque, see ibid. 78-80.
spirited and elegant presentation of the old theme, the judgment of Paris,"and his Contention of Ajax and Ulysses (1640), immortal for the magnificent lyric, "The glories of our blood and state," with which it concludes. Finally, it seems altogether probable that a larger proportion of masques has perished than of some classes of the more regular drama. For masques were for the most part devised for private entertainment and by poets who lived less in the public eye, ephemeral productions of occasional literature which the world could well spare. Schelling, Felix E. Elizabethan Drama, 1558-1642. New York: Houghton Mifflin & Company, 1908. 93-138. Created by Anniina Jokinen on August 2, 2006. Last updated on August 9, 2010.